Daniel Cloutier, born and raised in New England, started playing trombone at age 13. Within three years he was performing professionally in the Norwalk (CT) Symphony Orchestra, beginning a long and colorful orchestral career, including early positions (most of them Principal Chair) in the Illinois Philharmonic, the Elgin Symphony Orchestra, the Lake Forest Symphony, and the South Bend Symphony Orchestra. More recent positions have included the New Orleans Symphony, the Minnesota Opera, the Saint Paul Chamber Orchestra, the Minnesota Orchestra, the Knoxville Symphony Orchestra, and the Pittsburgh Symphony Orchestra. He has also performed on Broadway in a revival production of Peter Pan starring Cathy Rigby. Cloutier received his Bachelor’s Degree from Northwestern University—where he studied with Frank Crisafulli and Arthur Linsner—his Master’s Degree from Carnegie Mellon University, and his Doctorate of Musical Arts from West Virginia University. 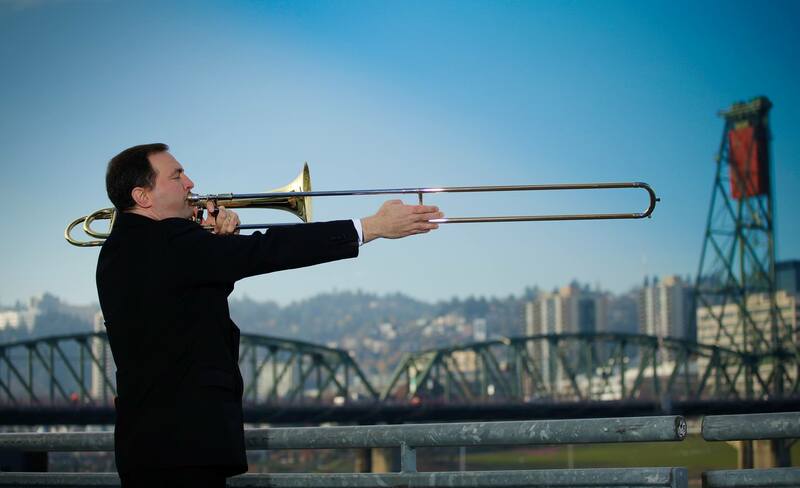 Cloutier is currently Principal Trombone of the Grant Park Orchestra and Acting Principal Trombone of the Oregon Symphony. The list of artists with which he has performed is notable, including such names as Carlos Kalmar, Neeme Jaarvi, Edo DeWaart, Wolfgang Sawallish, Donald Runnicles, Marin Alsop, Hans Vonk, Simon Rattle, Leonard Slatkin, Maxim Shostakovich, Marvin Hamlish, Peter Nero, and Richard Hayman. The venues in which he has performed rank among the top concert halls in the world, including Symphony Hall in Boston, Carnegie Hall in New York City, the Proms (Royal Albert Hall) in London, the Berlin Philharmonic Hall, and Suntory Hall in Tokyo. Cloutier is a strong supporter of new music; he has premiered three trombone solos: Sideways Glances by Kenneth A. Jacobs (premiered in 2012), Dance to the Music of Time by Wesley Ward (premiered in 2004) and Precipice by Stephen Taylor, (premiered in 1991). Also known as a composer and arranger, Cloutier has composed two trombone quartets, one brass quintet, and one short work for brass choir. He has numerous arrangements for trombone quartet, trombone choir, and brass quartet.